These games, tests and exercises are not an identical copy of what you have to do during the test, but they are designed to help you practice your vocabulary in the three important areas listening, reading and writing as well as pronounciation. 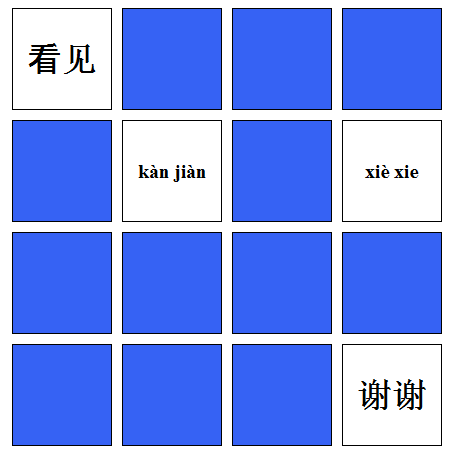 Character to Pinyin: This game concentrates on pronounciation. Pronounciation might not be that important for the test itself, but has a huge impact on how good your Chinese sounds to native speakers. Sound to Character: This flashcard-like exercise allows you to practice and test your listening skills as well as characters. This is very useful for the listening part of the HSK test, as this sort of skill is needed to answer questions in the first part of the test. Sound to Pinyin: Particularly in the beginning it is quite difficult to hear tones and get used to this pretty difficult part of Chinese. This exerciese can help to do so and is not just useful for beginners but also for advanced learners. Character to Meaning: Without any doubt this exercise is one of the most important one and can be used to test yourself if you are ready for this HSK level. Knowing the vocabularies and what they mean is extremely important to be able to master the reading part of the test, but also for listening vocabularies are key. Meaning to Character: This exercise doesn't help with writing directly, but rather with connecting what you want to say with characters. Being able to do this quickly is important for writing sentences, regardless of the level of the HSK test. Character to Pinyin: Pronounciation is not key for the HSK test itself, but it is for real life. If you want to talk to people you'd better get the pronounciation right, the better your Chinese gets the more important this factor gets!